This week’s #favoritething is the biggest gift I’ve received this year. A gift I purchased with my own spending money the moment I found out it existed. The book is called Different. All you sweet ones who are worried about your adhd, odd, ocd kids, autistic, Aspergers, physically disabled, too loud, too quiet, difficult or “different in some way” child, know that you are not alone. This book was Nathan’s idea. “Mom, we need to encourage others who feel out of the box or have an out of the box child so they can be encouraged by our story.” And so Nathan’s idea is now this book. Apart from my own mother, Sally Clarkson has been the one person who has most influenced my ideas of housewifery and motherhood. Her books (The Ministry of Motherhood, The Mission of Motherhood, The Life-Giving Home) are always filled with inspiring, practical ideas and heaps of grace. So when I found out last month that one of her children shares some of the needs and diagnoses of my own boys, I was shocked, thrilled, and encouraged beyond words. Sally has always carefully protected her children even while writing honestly about motherhood. 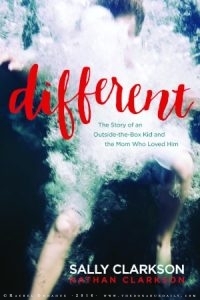 Now that she and Nathan are telling their story together, I see so much hope for parents of “different” kids like me–for it validates not only our current experience, it also means that the practical wisdom and ideas from her other books on motherhood and homemaking are possible even in a home where special needs are disruptive to the daily flow of life. Indeed, such practical wisdom was shaped there. In addition to hearing from Sally’s heart, we get to hear about life from Nathan’s perspective, too. Ever wonder what’s going on in your child’s head? Thanks to Nathan’s openness, we get a glimpse. What I read moved me toward more compassion for and understanding of my own boys, and for that I am eternally grateful. Parents, does this not resonate with you? Many people wanted to label Nathan with consonants and vowels and or tell me to spank him more, but after many years of studying him, trying to reach him, train him, understand him, I knew in my heart he had the making of a great man and he needed a whole lot of love, patience and faith. I also knew that he was a lot like me–just made to be active and questioning and out of the box of norm. I can now see in my own life, that what has always felt like too much for me–my personality–was just what God needed me to be so that I would love speaking and writing and traveling all over the world. Do yourself a favor: buy this book, read it, and be deeply encouraged. This one’s for you. *Our Favorite Things are simply that. We receive nothing in return for sharing them with you except the satisfaction of knowing that we’ve connected other parents with something we’ve found encouraging.